Thomas Cole (1801–1848), The Voyage of Life: Old Age (detail) (1842), oil on canvas, 133.4 × 196.2 cm, The National Gallery of Art, Washington, DC. By Daderot, via Wikimedia Commons. 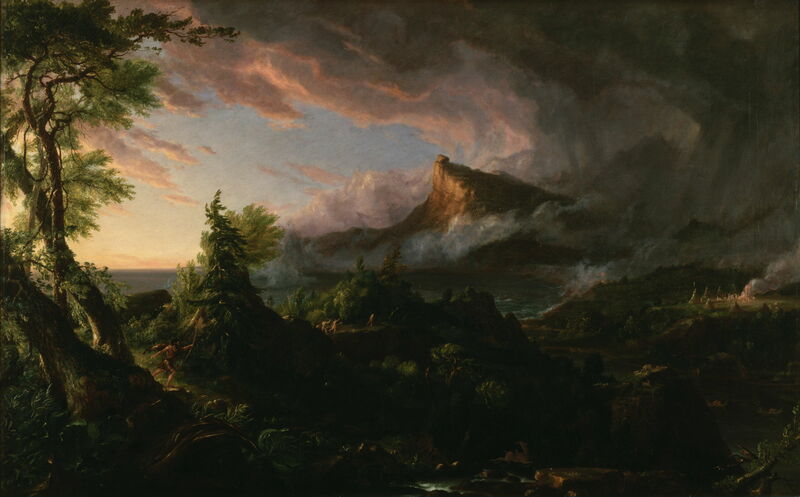 Thomas Cole (1801–1848) is generally accepted as the founder of the Hudson River School of landscape painting, and is one of the founding fathers of American landscape painting. A migrant who arrived at the age of 17 in 1818, he was taught by an itinerant portrait painter, and in 1825 helped found the National Academy of Design in New York City. Many of his landscapes were very narrative, and his paintings bear comparison with the works of Poussin and Claude Lorraine in the early development of European landscape painting, and their themes. I have not been able to discover whether Cole was influenced by Hogarth or others to embark on such a series. At that time he had not visited Europe, and such influence would appear unlikely, so it is more probable that this was simply the logical extension of his previous narrative paintings. Thomas Cole (1801–1848), The Savage State (The Course of Empire) (1834), oil on canvas, 100.3 x 161.3 cm, New-York Historical Society, New York, NY. Wikimedia Commons. The Savage State shows dawn, with a rainstorm clearing over a broad river estuary. In the distance, on the other bank of the estuary, is a rocky crag, dominated by a massive block. In a clearing at the right there are the native people’s tipis clustered around an open fire, and files of those natives are seen streaming through uncleared land to return to that camp. In the left foreground they are seen hunting with a bow and arrows, and they are also shown paddling along small rivers in canoes. These appear to refer to the original peoples of North America. 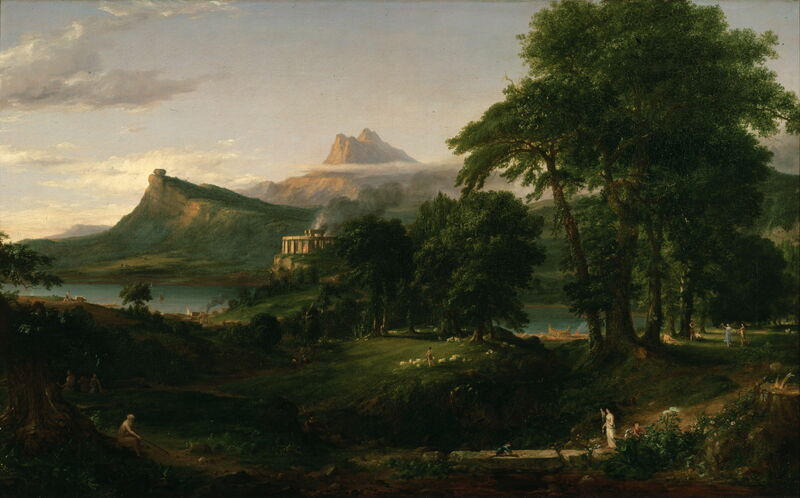 Thomas Cole (1801–1848), The Arcadian or Pastoral State (The Course of Empire) (1834), oil on canvas, 100.3 x 161.3 cm, New-York Historical Society, New York, NY. Wikimedia Commons. The Arcadian or Pastoral State is set in the morning of a spring or summer day, the showers having cleared. The landscape shows the same landmarks, although from a slightly different view than in the previous painting. In the middle distance, a stone circle (clearly modelled after Stonehenge, England) contains a large open fire. Boats are under construction on the bank of the river, and the land has been partly cleared to provide pasture and mature patches of deciduous trees. The inhabitants are scattered through the pastures, tending flocks of sheep in an idyllic European pastorale setting. 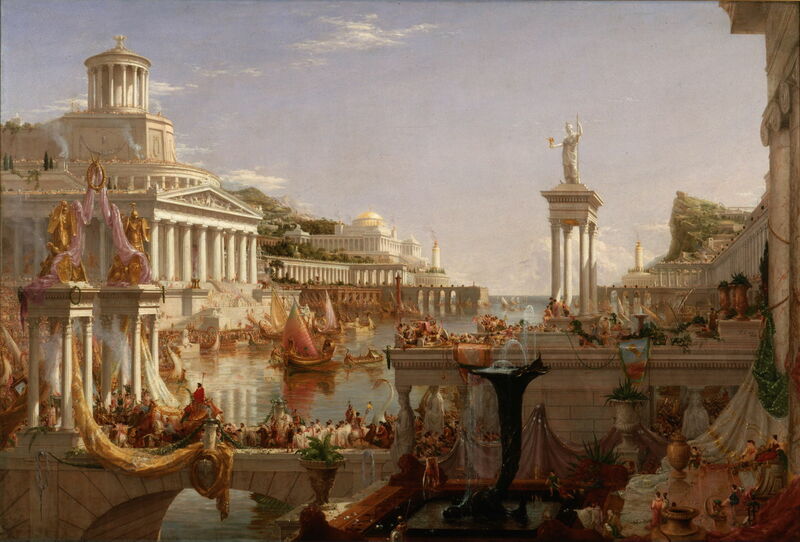 Thomas Cole (1801–1848), The Consummation of the Empire (The Course of Empire) (1836), oil on canvas, 130 x 193 cm, New-York Historical Society, New York, NY. Wikimedia Commons. The Consummation of Empire is a complete transformation, with only the rocky crag in the distance and the river giving any clue that it is the same location, but much later in time. It is now noon on a fine summer’s day. The banks of the river are filled with majestic buildings in marble in classical Roman style, with many colonnades. Their steps descend to the water’s edge, where there are small sailing boats and throngs of people. The inhabitants appear opulent, wearing toga-like dress, feasting and feting throughout the city. Large golden statues are decorated with fine textiles, there are exuberant fountains and potted plants. In the distance terraces above the buildings contain further trees and plants. Smoke rises from chimneys of a prominent building at the left, which is presumably an analogue for the previous stone circle. 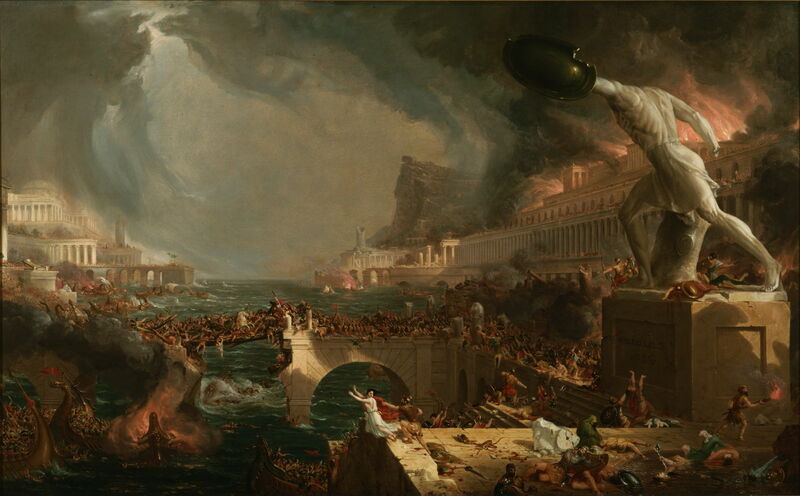 Thomas Cole (1801–1848), Destruction (The Course of Empire) (1836), oil on canvas, 100.3 x 161.3 cm, New-York Historical Society, New York, NY. Wikimedia Commons. Destruction shows a slightly wider and shifted view of the same scene, but now in the process of physical destruction. During a short break in an autumnal storm, in the afternoon, many of the buildings are burning vigorously, others damaged and collapsed, and the people fleeing in desperation. The river is choppy in the strong wind, and several of the boats on it are ablaze. In the foreground, one span of a bridge has been destroyed, and has been replaced by a sagging wooden pier. Everywhere there are crowds jamming the open spaces, some trying to board already full boats. Closest to the viewer are bodies of those who have been killed in the catastrophe. 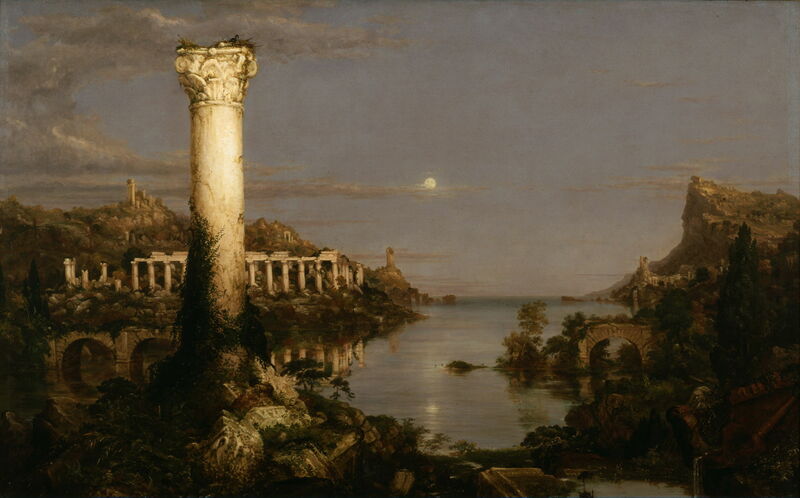 Thomas Cole (1801–1848), Desolation (The Course of Empire) (1836), oil on canvas, 100.3 x 161.3 cm, New-York Historical Society, New York, NY. Wikimedia Commons. Desolation shows the remains of the city at dusk on a winter’s day. The ruins of its buildings are being overgrown by vegetation. The bridge has a great gap where the arches have been lost. There is not a person in sight. Unlike Hogarth’s disjoint temporal sequence in Four Times of the Day (1736), Cole’s slightly different views are clearly of the same location: the distant rocky crag with its distinctive massive block is a repeated point of orientation, as is the river. In these he plays out the sequence of development of civilisation, through to its collapse and return to nature. The whole series thus forms a coherent narrative, which is of course an allegory. With that ambitious if not grandiose series behind him, Cole was commissioned to paint another series showing a Christian allegory of the stages of life. He divided this into childhood, youth, manhood, and old age, and in 1839 produced a set of sketches which are now in the Albany Institute of History and Art. 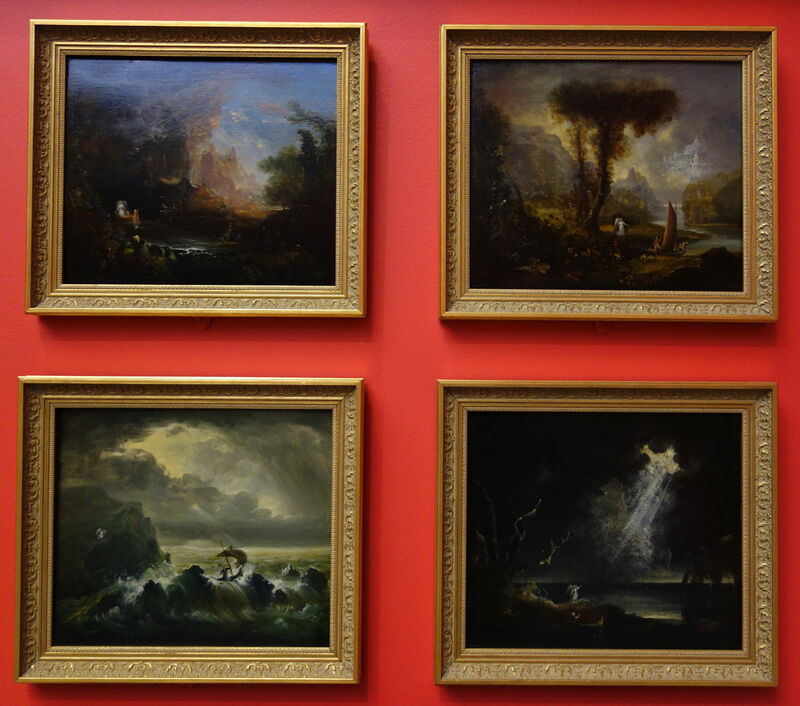 Thomas Cole (1801–1848), The Voyage of Life (set of sketches) (1839), oil on wood, each 30 x 33 cm, Albany Institute of History and Art, Albany, NY. By Daderot, via Wikimedia Commons. Those were soon followed by his first version, starting with Childhood (1839-40). These are now in the Munson-Williams-Proctor Arts Institute. 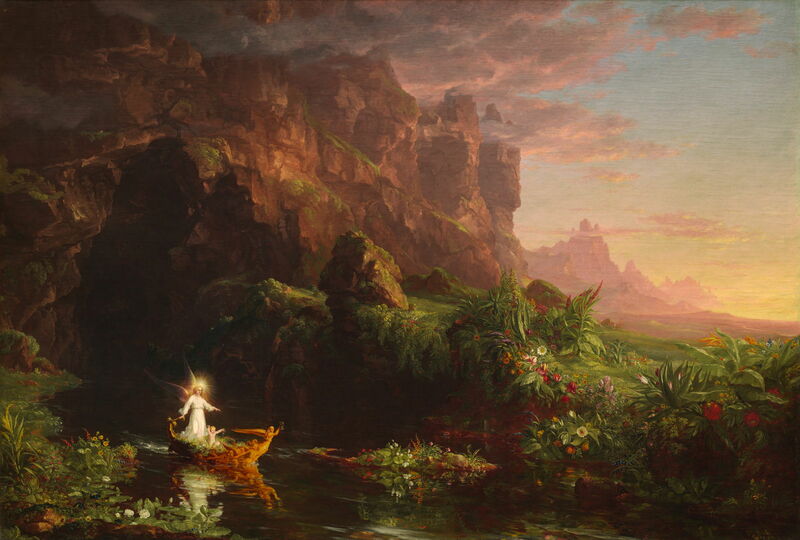 Thomas Cole (1801–1848), The Voyage of Life: Childhood (1839-40), oil on canvas, 65 × 91 cm, Munson-Williams-Proctor Arts Institute, Utica, NY. Wikimedia Commons. When he was in Rome in 1842, fearing that he would not see his series again, nor be allowed to exhibit it, he painted a second version, which is now in the National Gallery of Art in Washington, DC. 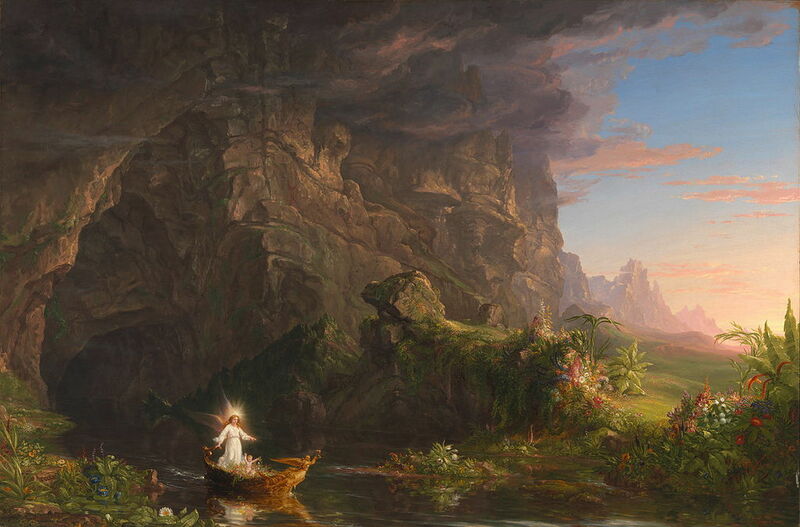 Thomas Cole (1801–1848), The Voyage of Life: Childhood (1842), oil on canvas, 134.3 × 195.3 cm, The National Gallery of Art, Washington, DC. Wikimedia Commons. Childhood establishes the scene: the lush coastal undercliff, rich in flowers and the vibrant green of vegetation. A boat has emerged from a large cave in the cliff (symbolic of the mother’s birth canal and the process of birth). 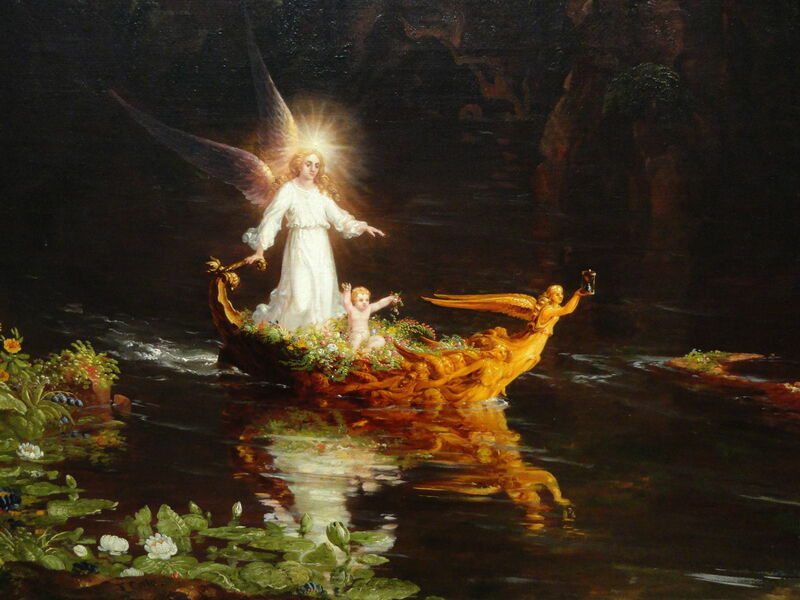 A young baby is standing in the boat, which has an angel at its tiller. A carved angelic figure forming the prow holds out an hourglass as the symbol for time. 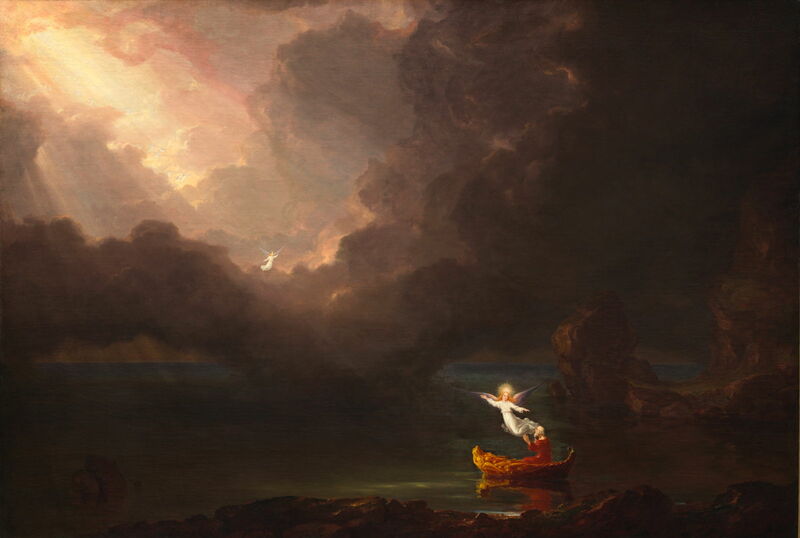 Thomas Cole (1801–1848), The Voyage of Life: Youth (1842), oil on canvas, 134.3 × 194.9 cm, The National Gallery of Art, Washington, DC. Wikimedia Commons. 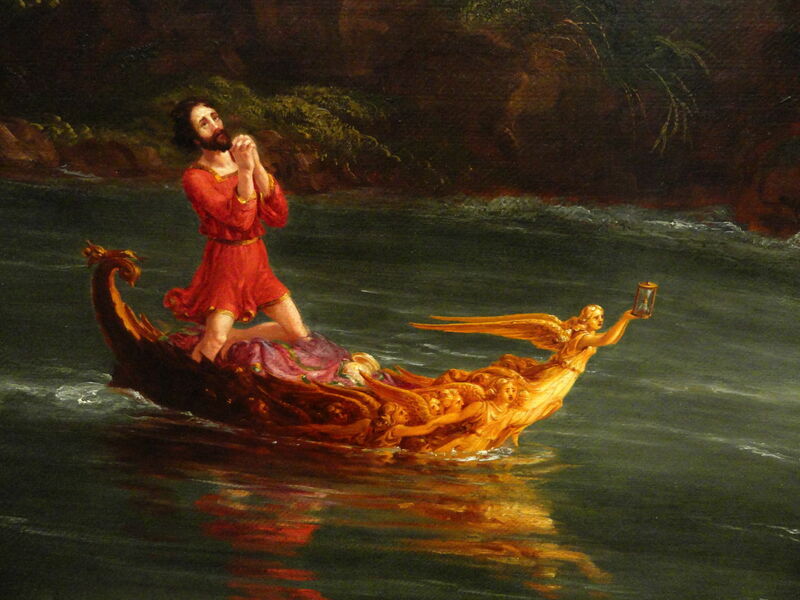 In Youth, the young man has taken the helm of the boat, leaving the angel on the bank. The morning light is bright, and the weather fair. The young man is navigating the boat along the river, through lush waterside meadows and avenues, towards a distant vision of a celestial temple. The coastal cliffs are now in the background on the right, and in the centre distance is a rocky mountain spire. 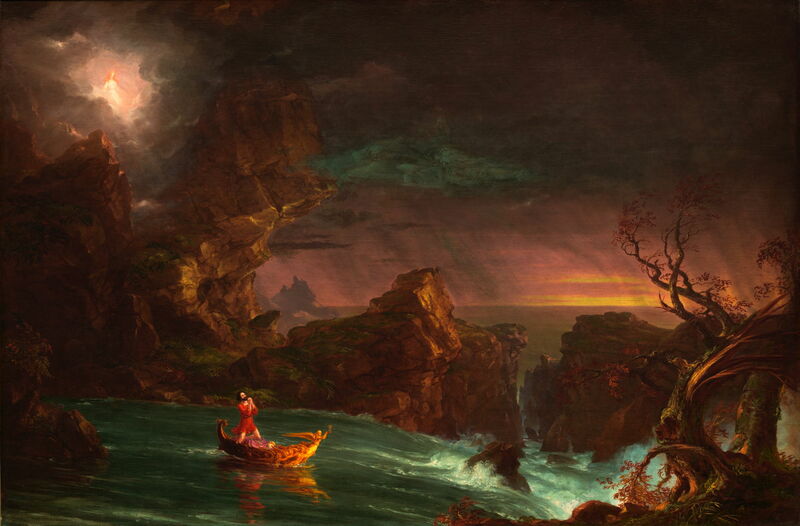 Thomas Cole (1801–1848), The Voyage of Life: Manhood (1842), oil on canvas, 134.3 × 202.6 cm, The National Gallery of Art, Washington, DC. Wikimedia Commons. By Manhood, the hero has noticeably matured, and his boat is on a fast-flowing river just approaching dangerous rapids which pass through a rocky chasm. It is now dusk, and the angel is watching over from a break in the dark and forboding clouds. The man no longer holds the tiller – indeed the rudder is missing – but both hands are clasped in prayer, as he looks anxiously up towards the heavens. In the foreground on the right are twisted trees, splintered by storms, with autumnal leaves. 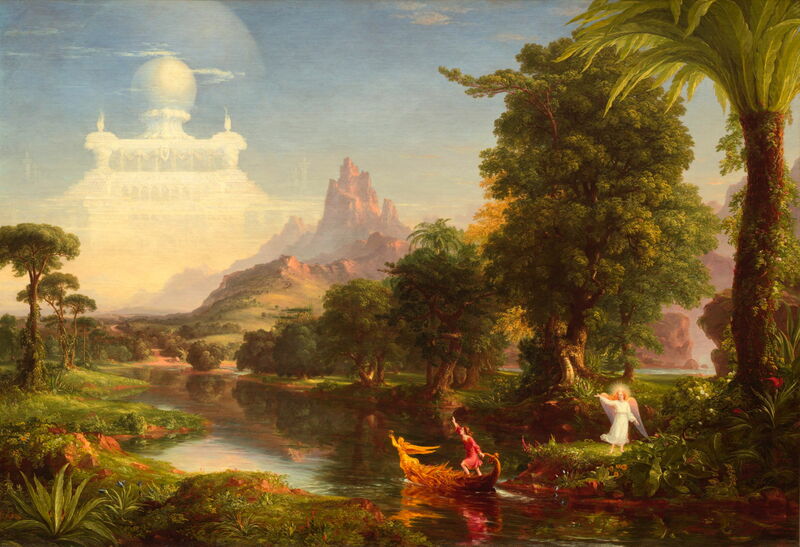 Thomas Cole (1801–1848), The Voyage of Life: Old Age (1842), oil on canvas, 133.4 × 196.2 cm, The National Gallery of Art, Washington, DC. Wikimedia Commons. Old Age shows the man in the boat far older, bald and with a grey beard. His boat is now in placid waters at the coast again, making no way. The boat itself is battered, its figurehead missing. 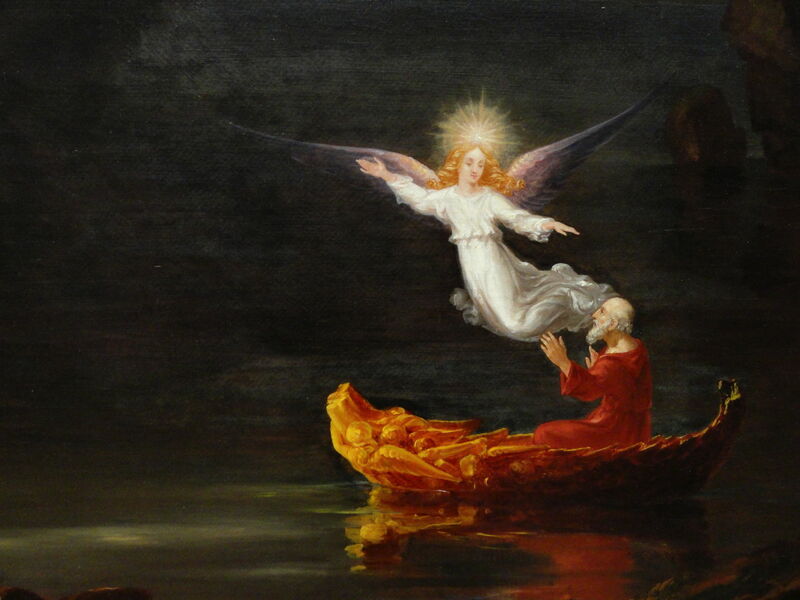 He sits in the boat talking with the angel, who beckons him up through a parting in the black clouds, to a distant angel, far up in the heavens, rising through beams of sunshine towards brightness at the top left. It is also worth studying the great detail which Cole has included in the man and his boat: the following detail views show the sequence of changes. Thomas Cole (1801–1848), The Voyage of Life: Childhood (detail) (1842), oil on canvas, 134.3 × 195.3 cm, The National Gallery of Art, Washington, DC. By Daderot, via Wikimedia Commons. 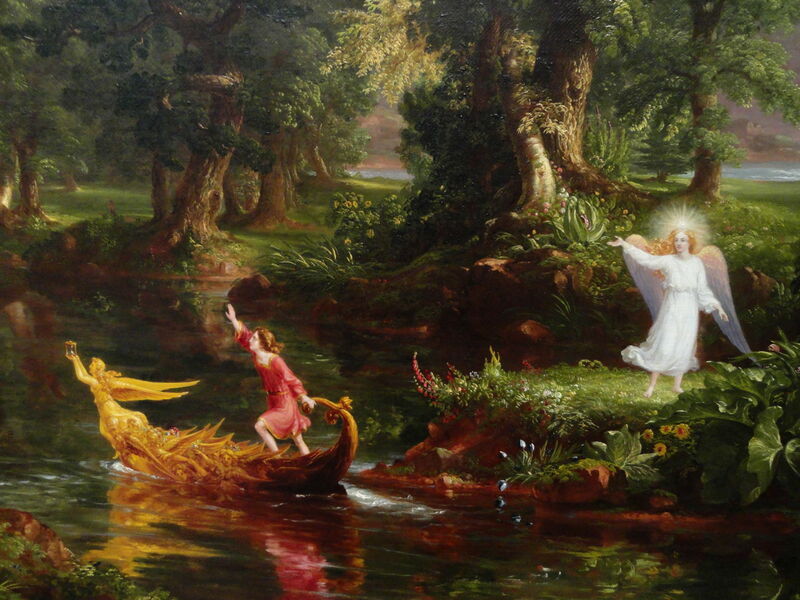 Thomas Cole (1801–1848), The Voyage of Life: Youth (detail) (1842), oil on canvas, 134.3 × 194.9 cm, The National Gallery of Art, Washington, DC. By Daderot, via Wikimedia Commons. Thomas Cole (1801–1848), The Voyage of Life: Manhood (detail) (1842), oil on canvas, 134.3 × 202.6 cm, The National Gallery of Art, Washington, DC. By Daderot, via Wikimedia Commons. As with his The Course of Empire, there are sufficient consistent threads running through this to ensure that it remains a narrative. Overall it is comparable to, if much simpler than, John Bunyan’s The Pilgrim’s Progress, and was well received given the religious views prevailing at the time. Cole’s two narrative series presented Romantic visions of the development and collapse of human civilisation, and of the phases of a pious life. He did not use identical backgrounds in each, but was careful to provide sufficient cues to ensure the viewer saw each painting as part of the overall narrative. His figures were too small for facial expressions to be visible, but body language and other cues proved good tools for his expression. The paintings are not as rich in cues, clues, and symbols as those of Hogarth’s series, but still make good use of timeless symbols to support their stories. In short, they work well as narrative series, and each painting is both impressive and expressive. It is tragic that Cole died so soon after completing the second version of the second series. The Thomas Cole National Historic Site. Posted in General, Painting and tagged allegory, Cole, Hudson River, landscape, narrative, painting, series. Bookmark the permalink.